The ingredients and process of great artists do not always follow the "textbook format," and Modest Mussorgsky, who occupies a place in my upcoming anthology, soon to be published by Oxford University Press, is a prime example of this. Proceeding from the conviction that human speech is strictly controlled by musical laws, Mussorgsky considered the function of art to be the reproduction of musical sounds not merely of feelings, and this applied, first and foremost, to his feeling about human speech. I find Mussorgsky's reflections interestingly individual and profound. In my upcoming publication, due in May, one of the several composers represented is the Romantic Era's German composer, Peter Cornelius, famous for his opera "Barber of Baghdad," and famous in song, particularly, for his "Christmas Songs" (Weihnachtslieder). What many may not know is that Peter Cornelius was really a very prolific song composer, and thought of himself as a “poet-composer.” He wrote half of the poems for his own songs, not just those for his "Christmas Songs," as is widely thought. He was respected among his colleagues, many of whom set many of Cornelius' poems to their own music. I find this sort of information enlightening. It was thought, and quite correctly, that Cornelius had a feel for rhyme. He exemplified this, to the extreme, by often constructing his German poetry with sentences of rhyme within rhyme, so English "singing translations," for his material, mean creating rhyme within rhyme, as well. This is an extra hurdle for the translator, considering that the "singing translations" need fit the "double-whammy" rhyme of the Cornelius German and the designed rhythm of the Cornelius composition. The tone of a discussion takes on an organic quality always, and it will evolve in whatever way it needs to evolve. If you think too far ahead, you will keep yourself from communicating, and that is counterproductive. Those people who naturally emit a strong sense of joy-if you will, effervesence-can carry a mood and conversation, and instill an attractiveness into it, and into a conversation partner, with their focused and attentively caring positivism. Enormously winning, as well, is finding oneself in the midst of a good listener. Listening is a basic way to connect with another person. Caring attention, whether flowing or still, is the most powerful thing we can give each other. It's even possible to find the former and later qualities, and quantities, in one individual, and it's up to that individual to fine tune the energy output according to the discussion partner. A responsibility worth taking, considering the gift. The Russian repertoire suits me and has been associated with me over the years, due to my being the first singer to win the Gold Medal in the famed International Tchaikovsky Competition in Moscow, so I was not surprised, but still honored and challenged, at being invited to the noted Italian festival in Perugia, "Festivale di Sagra Umbra Perugia." This festival was founded by the noted Mo. Siciliani (then, Chief of the RAI Italiano-Italian Radio & Television-and Teatro alla Scala Milano, and the conceptual creator of the famed fall timed, "Festivale di Sagra Umbra Perugia"). Mo. Yuri Aronovitch (former Chief of the Moscow Radio Symphony Orchestra) knew me from my Russian triumph and asked Mo. Siciliani to engage me in the title part of Fevronia-in the original and antiquated Russian-in Rimsky-Korsakov’s "Invisible City of Kitish and the Maiden Fevronia," to be performed at the festival. At a rehearsal, noticing Mo. Aronovitch’s extraordinary watch, I commented with glee and admiration, "Oh Yuri (first names are etiquette and custom in Russia), what a wonderful watch!" Whereupon, he took it off and handed it to me, saying: "In MY country when someone admires something, it means she wants it." I said, "Yuri, we're not in YOUR country, we're in Perugia and I love your watch, but I don't want it", and I handed it back to him. He would have none of it and refused to accept this gorgeous thing back, so I gave it to the chambermaid in our hotel and asked that she put it in his room, only to find that he’d done the same, and I would find the watch back in my room. This went on until I realized his resolve and stubbornness, so we continued intensely to work on the beautiful and massively long piece at hand (over 4 hours) and the episode was put aside for the moment. I was, joyous to everyone, able to have the last laugh, however, when the cast decided to "dress" for a festive cast party, after the final performance at an unusually early hour for Italy-the performance having begun in very early evening. I, then, wearing Kelly green slacks, a longish tunic and everything coordinated, entered the lobby of our hotel, where everyone was waiting, and Yuri said in a loud voice, "Oh Janetchka, what beautiful greeeeen pants!" Whereupon, I took them off, handed them to Yuri, and went to the party in my underwear and longish tunic. Everyone was screaming with laughter, having experienced the "watch" episode earlier in the rehearsal period, to say nothing of screaming at my impromptu outfit! This story makes me laugh just recounting it. A wonderful scene and a fun resolution for all! "The process of getting there is the quality of being there. "...The point being, "enjoy the process." It makes the whole gamut one experiences an adventurous party! 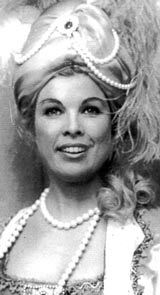 In focusing on a book, recently given me, about the great opera singing actress, Astrid Varmay, I am drawn to a thought about communication in general. The extraordinary can be communicated extraordinarily. Speaking as well as doing is a big asset. Extraordinarily high level creative artists often speak an artistic language, off-stage, as it were, which is exclusive to few. But if you can "tune into" them and their world, you are in the midst of a gold mine of incredibly satisfying learning material. Such high-level types talk in the stratospheres and many do not communicate easily and simply to the average John Doe, and often the challenge to do so is parochial to this level of creator. Moreover, their communication "thinking-tools" are bolted high for the average guy. They speak, so to say, "doctor talk" unwittingly. Seldom can such an individual get genuinely "uncomplicated," when communicating about his craft, often leaving part of the world out. If such an extraordinary individual also has the ability to get extraordinarily simple in dialogue about himself and the tools of his craft, watch out, because an incredible glory can be born! Needing people as a validation to personal self-worth gives others the authority over you. Needing people as an expression of your affection and ability to love reinforces your belief in yourself and self-worth. Attitude is the lever to change. If, for example, you are going for a major change in your life, you will have to deal with the attitude and beliefs that kept you from having it in the past.